This weekend I had the epitome of a “staycation.” No plans except to sleep in, cook good food and watch the second season of Mad Men with Mark. On Sunday night we decided to open up a great bottle of syrah and slow cook a pork belly with a homemade huckleberry sauce. 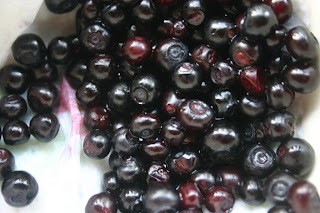 We had gone to the Sunday farmers market earlier in the morning and purchased a pint of foraged huckleberries from Christina Choi at Foraged and Found Edibles. The berries were plump and glistening, looking like violet caviar, simply perfect for a thick piece of pork belly. We roasted some golden beets and Ozette potatoes we had purchased from another vendor to add to our pork belly. After searing the pork belly on all sides, I removed it from the heat and set it aside. Next I added 1/4 cup of finely chopped shallots and sauteed them over medium-high heat with a good pinch of salt and pepper. I deglazed with some balsamic vinegar and syrah wine. 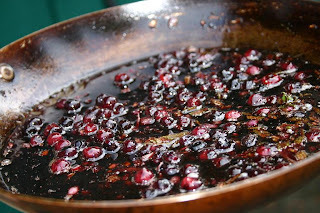 Next I added 1 cup of wild huckleberries, 1/2 sprig of fresh rosemary, two fresh sage leaves, a fresh oregano sprig, two garlic cloves that were smashed only slightly and a sprinkling of brown sugar. I brought the pan to a simmer and let the sauce work it’s magic for a couple minutes. Next I added the seared pork belly back to the sauce, covered it and let it cook at 300 F for almost two hours, turning the meat half way through cooking. Once the meat was more than fork-tender, I removed the pan from the oven and onto a plate. 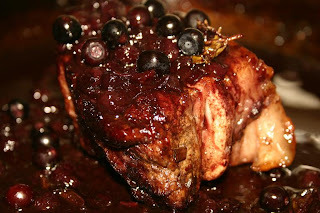 I covered the pork in the sauce and sprinkled on another handful of the uncooked huckleberries for color and a nice tang to balance flavors.